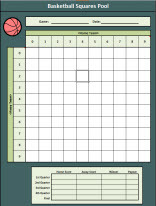 Our FREE Basketball Squares Pool Template can be used for your next office pool. Enter the Home and Away teams into the template, as well as randomly drawn numbers from 0 to 9. Determine payouts and then print the template as a sign-up sheet. Players enter their name into squares based on their guess at the last digit in the score for each quarter. This template can also be distributed electronically for sign-up. Be sure to display the completed spreadsheet on your bulletin board - winners like to see their name on display!